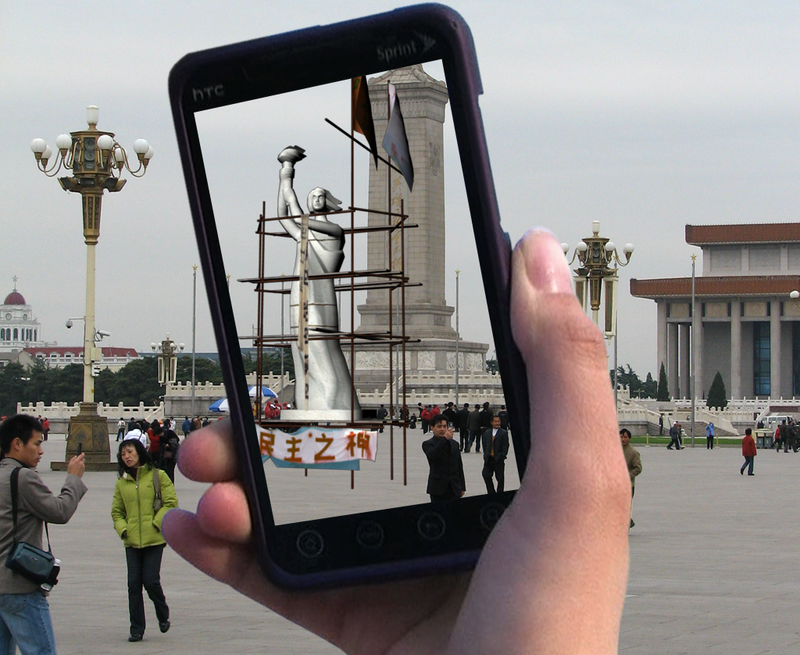 Tiananmen SquARed is a two part augmented reality public art project and memorial, dedicated human rights and democracy world-wide. 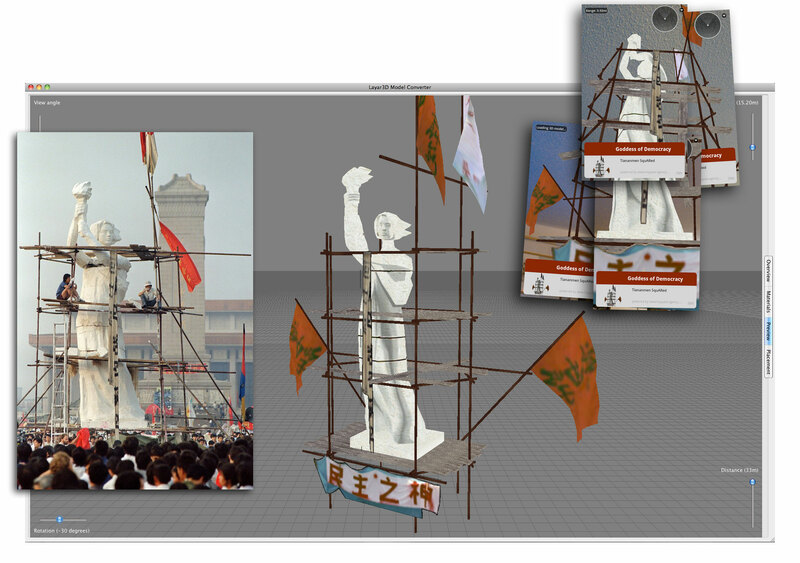 The project includes virtual replicas of the Goddess of Democracy and Tank Man from the 1989 student uprising in Tiananmen Square. Both augmentations have been placed in Beijing at the precise GPS coordinates where the original incidents took place. The Goddess of Democracy was a 33-foot tall statue, constructed in only four days out of foam and papier-mâché over a metal armature. Students from an art institute created the statue, placing it to face toward a huge picture of the late Communist Party chairman Mao Zedong. 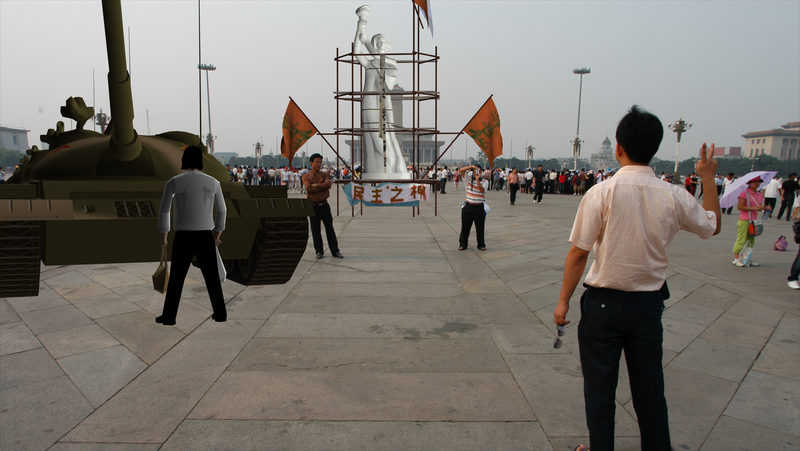 Tanks later flattened the statue when China’s military crushed the protest. 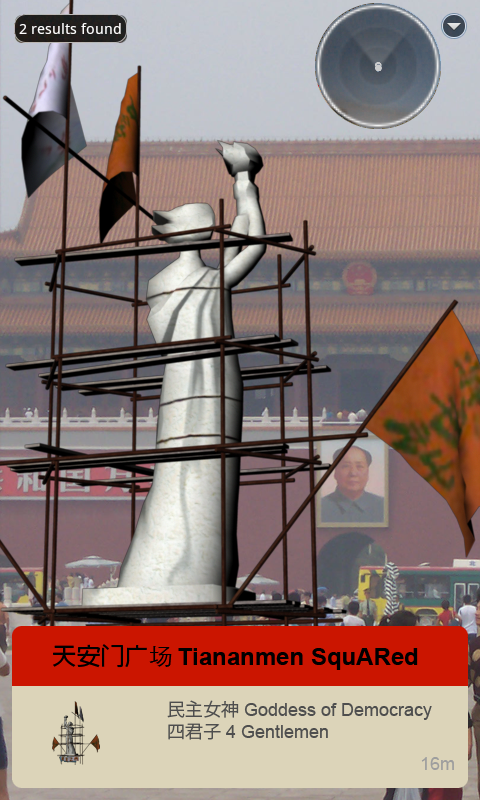 The Goddess of Democracy augment model in the development environment with AR test montage and reference image by Toshio Sakai-AFP, taken on May 30, 1989 in Tiananmen Square. 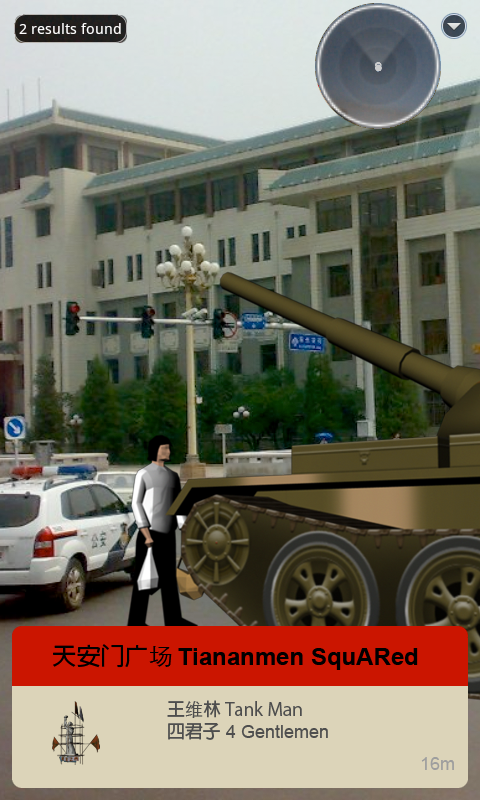 Tank Man was an anonymous man who stood in front of a column of Chinese Type 59 tanks the morning after the Chinese military forcibly removed protestors from in and around Beijing’s Tiananmen Square on June 5, 1989. The man achieved widespread international recognition due to the videotape and photographs taken of the incident. 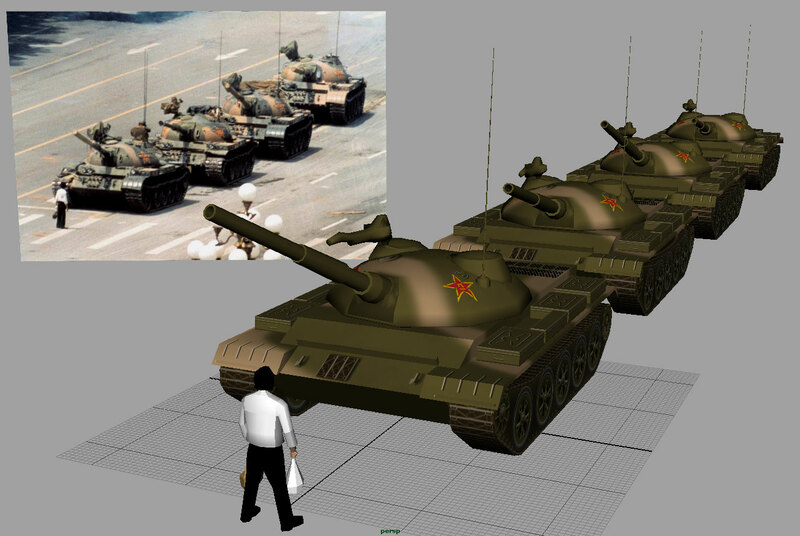 The Tank Man augmentation model in the development environment with the iconic photograph, taken by Jeff Widener of the Associated Press as a reference image. Although it has been more than twenty years since Tiananman Protest took place, the authorities persistently use all means possible to erase the fact that the Chinese people pursued democracy in this democratic and anti-corruption movement. Today in China, young people are not aware of the courageous actions that Tank Man and the Goddess of Democracy represent. Nonetheless, history should not be forgotten. Information and communication technologies have inspired people to express their thoughts freely. We as artists, taking advantages of the development of mobile phone technology and smartphone applications, have revived the history of 1989 Tiananman Protest that has tremendous implications waiting for further examinations by our contemporaries. Download the Layar Augmented Reality Browser. 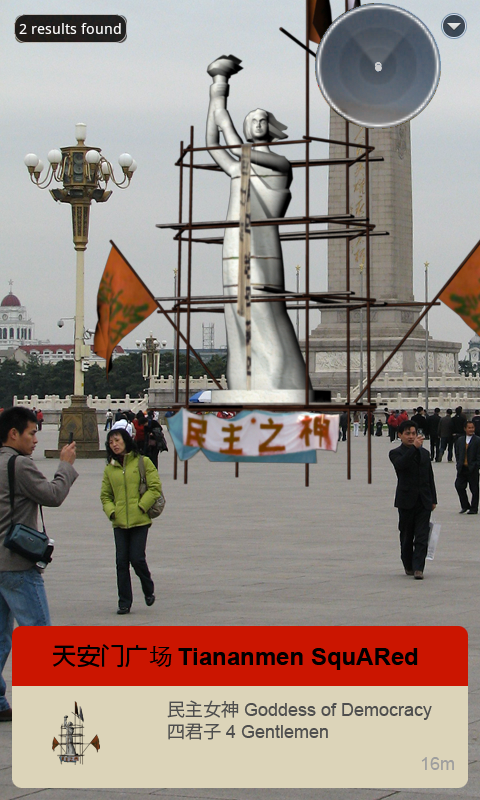 Launch the Tiananmen SquARed project on any late model Android or iPhone, or iPad stand in Tiananmen Square and point the device’s camera towards the northern side of the plaza where the Goddess of Democracy was originally erected. The application uses geolocation software to superimpose the virtual Goddess of Democracy at the precise GPS coordinates of the original. 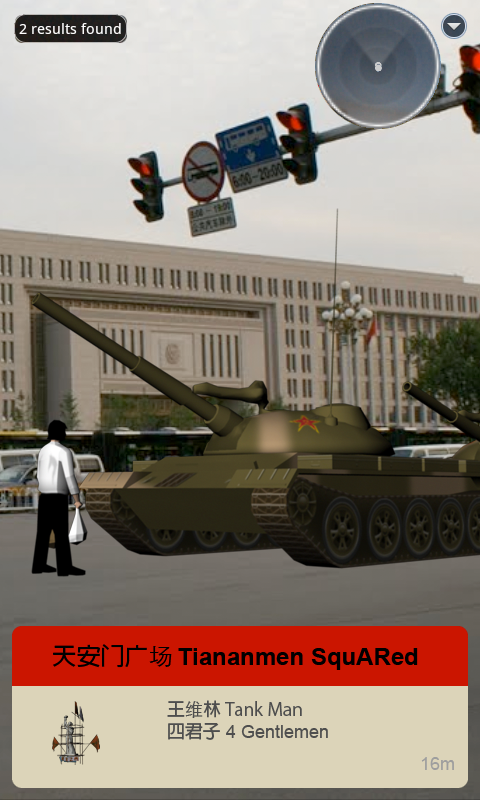 Similarly, virtual Tank Man can be seen on Chang’an Avenue northeast of Tiananmen Square in the exact location of the original event. Both augmentations will appear in the original scale and orientation. Piazza San Marco, Venice, June 2011. Tahrir Square, Cairo, Egypt, May, 2011. Institute of Contemporary Art, Boston, April, 2011. Union Square, New York, February 2011.